I won’t lie. 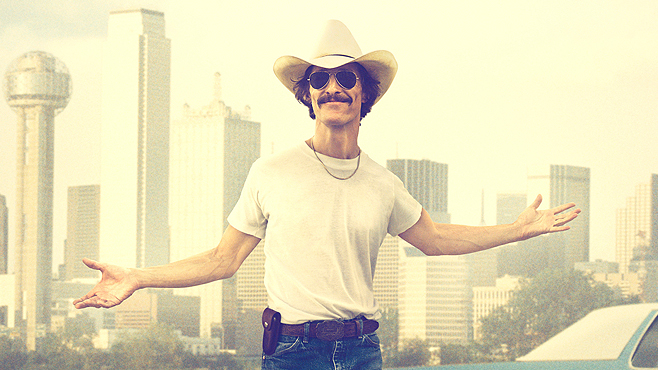 The circumstances I saw Dallas Buyers Club in weren’t… ideal. Don’t get me wrong, I really wanted to see it, the people I was with were amazing, but, to be fair, I feel like I owe them all an apology! You see, I was meeting up with this incredible group of women (who I work with from time to time) for our Christmas party. We met at the theater bar, had a (few) glass(es) of wine, did a gift exchange and right when we were supposed to go into our super sappy rom-com we found out it was sold out! While rolling over our options some one just so happened to mention Dallas Buyers Club, someone else said they heard it was good and I, perhaps with too much exuberance, proclaimed that I had heard the same and been wanting to see it… poor move. Without further questioning the tickets were purchased. I had a glass and a half of wine under my belt without having had dinner… so frankly I didn’t think twice about what we were walking into with our arm loads of goodies and popcorn in hand. As much as I want to take back my enthusiastic suggestion to see this movie, I can’t regret it. It makes for a great story… just not a very festive one.